All Air Force basic military training (BMT) is conducted at Lackland Air Force Base near San Antonio, Texas. Your airman will have the most up to date information for the date and time of their graduation from basic training. There are many family events planned during graduation weekend in addition to the the actual basic training Graduation ceremony. 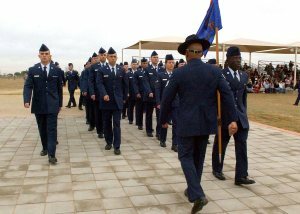 Check out the link below for Lackland Air Force Base specific information along with hotels in the general area.